On tap at Row 34 Boston. Pours slightly hazy light gold with a fine white head. Aroma is saison and lemon peel. Flavour is thin citrus and flowers. Finish is smooth and slightly sweet flowers. Draught @ BrewDog Shepherds Bush, 15-19 Goldhawk Road, Shepherds Bush, Greater London, England W12 8QQ. 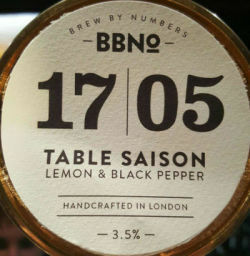 [ As Brew By Numbers 17/05 Table Saison - Lemon & Black Pepper ]. Hazy. Super bright yellow with a large, fairly creamy head. Aroma is lemon peel. Taste is fresh lemonade and black pepper. Bottle from Bierkoning, Amsterdam. Aroma is citrussy and spicy with lemon, soft black pepper, yeast, wheat, and mildly floral. Flavour is light sweet and bitter with a hint of tartness. Body is light. Very easy and drinkable, nice citrus aroma. Tap, 25cL. 3.5%. @bar "Maloan", Rennes, FR. With a clafoutis. A golden pale yellow clear beer with a small white foamy head ; medium retention. Lemon, herb, light resin. Light dry acid refreshing, light dry bitter spicy ; balanced. Light body, thin texture, average good carbonation, dry acid refreshing lasting finish. Overall, good ! 330 ml bottle gifted by Leighton, much thanks! Pale yellow color with a thin white head. Aroma is huge squeezed lemon, bold citrus throughout the sip. Great yeast representation with a mild black pepper finish. Maybe a tad bit peppery in the finish. Still nice! easy to drink, tasty. 19/08/17 Bottle at home, purchased at Cotteridge Wines Birmingham. £2.3 for 330ml bottle. Tap @ Howl at the Moon, Hoxton, London, 24/07/17. Pours a hazy, pale yellow with a good, white head. Aroma is lemon and spiciness. Taste is lemon, black pepper, general spiciness. From tap. Pours hazy yellow. Small white head. Aroma is citrusy and mild lime.grassy, herbal and sligh citrusy. Dry and herbal. Lime and grassy to herbal finish.